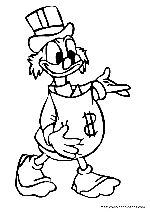 Scrooge McDuck or Uncle Scrooge is a Glaswegian anthropomorphic duck created by Carl Barks that first appeared in Four Color Comics #178, Christmas on Bear Mountain, published by Dell Comics in December, 1947. 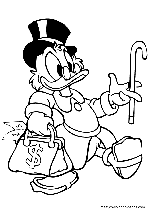 Over the decades, Scrooge has emerged from being a mere supporting character in the Donald Duck oeuvre to a major figure of the Duck universe, even giving it its popular name Scrooge McDuck universe. 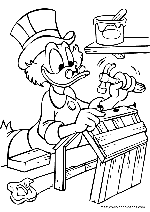 In 1952, he was given his own comic book series, Uncle Scrooge, which still runs today. As the character's popularity rose, he appeared in various television specials, films, and video games. 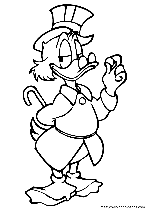 Scrooge, along with several other characters of Duckburg, has enjoyed international popularity, particularly in Europe, and books about him are frequently translated into other languages. 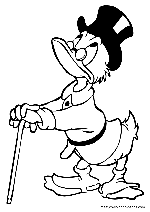 Scrooge is a V.I.P. member of the Mickey Mouse Club. 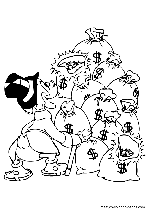 Some comic book cultors consider him a comic supervillain due to his often selfish and greedy behaviour. 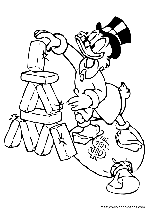 Scrooge McDuck's given name is based on that of the miserly Ebenezer Scrooge, the main character from Charles Dickens' 1843 novel A Christmas Carol. His Scottish heritage plays on the stereotype of Scotsmen being miserly. 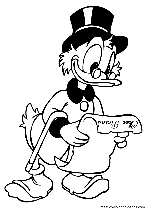 Although never explicitly confirmed by Barks, it is theorized that Scottish industrialist Andrew Carnegie, who left his country for America at 13, served as a model for Uncle Scrooge (in Don Rosa's The Life and Times of Scrooge McDuck, Scrooge leaves Scotland for the United States at age 13). 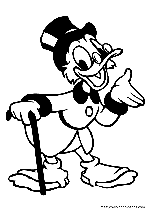 There is conjecture that another potential prototype for Scrooge was a character (with no name, actually Donald Duck's "thrifty saver" conscience) who had many of Scrooge's characteristics including sideburns, glasses and Scottish accent, that was featured in the Disney-produced World War II propaganda film The Spirit of '43 in 1943. 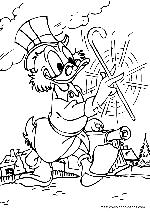 Scrooge, maternal uncle of previously established character Donald Duck, made his first named appearance in Christmas on Bear Mountain in December 1947, a story written and drawn by artist Carl Barks. 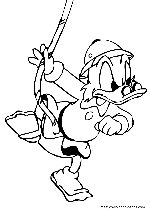 His appearance may have been based on a similar-looking, nameless Scottish character from the 1943 propaganda short The Spirit of '43. 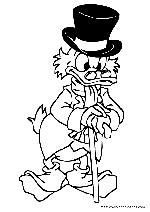 In Christmas on Bear Mountain, Scrooge was a bearded, bespectacled, reasonably wealthy old duck, visibly leaning on his cane, and living in isolation in a "huge mansion". Scrooge's misanthropic thoughts in this first story are quite pronounced: "Here I sit in this big lonely dump, waiting for Christmas to pass! Bah! That silly season when everybody loves everybody else! A curse on it! Me—I'm different! Everybody hates me, and I hate everybody!" Barks later reflected, "Scrooge in 'Christmas on Bear Mountain' was only my first idea of a rich, old uncle. I had made him too old and too weak. I discovered later on that I had to make him more active. I could not make an old guy like that do the things I wanted him to do."